I want everyone to humor me and keep reading. Listen carefully as the drum circle commences. So many of my fellow bloggers have decided to be no – award zones. I really do understand. But here is the thing: I like to grow community and one way to do that is to introduce people to more people. This works really well, by the way. How do I know it works? Well, the last time a well established blogger reblogged one of my posts, my stats were off the charts and I inherited many new followers. I also have noticed that many of my long time readers have went on to follow many of my award nominees. It is so heart warming to see new connections forged. Here is the process: I will display the award on my award page and ask all those who accept to display the award wherever they choose. In addition I will be shortly announcing my initial list of nominees. Eventually more will be added to the list. Please check these blogs out whether they accept the award or not. Know that these individuals have given some of their unique spark to the collective flame. I will also inform folks that they are on the list. I do not mind being a nudge if it is for the greater good. I have been called much worse I can assure you! Scroll down below for the first group of drummers. Can you hear the soulful rhythms and powerful stirrings begin to build? All five have huge hearts that combine ideas with action. Life here is simply elevated because they are part of the human experience. While many of us follow the beat of a different drum, the cacophony is only superficial. In the larger scheme of things, we all produce harmonizing vibrations that ultimately beat as one. blog loveno rules really does rule! Oh, this is exactly the kind of awards that are so meaningful to those in the community! Even though you’ve already gotten ‘gifted’ the sacred drum, know that I think you should display it twice, cuz I’d nominate you too! Yes there is something special about awards made and given with heart. I still have your awards prominently displayed at the 111 Global Party ( which never stops) and on my Awards page. While most folks I know don’t do awards anymore, I enjoy connecting folks and learning new things about bloggers ( via the Q and A requirements). 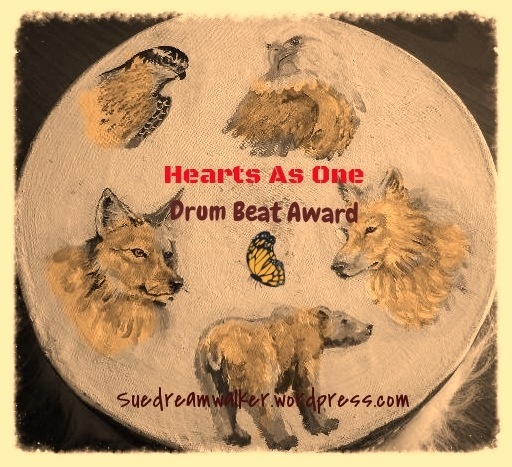 A beautiful honour you have gifted me to share my Drumbeat award on May 1st especially.. 🙂 a double gift on my special day.. 🙂 I congratulate all whom receives this award ..
Love and Blessings and I hope you are feeling much brighter.. I knew it was coming, but it was sheer Divine guidance that led me to post on your Birthday. Wishing you a blessed and joyful year ahead. Apparently I am the only one who does not blog on my phone! I took the tulips pics and shot some more today, thanks! Congrats on your new house, yea! it is back to just one beat.. I don’t know what this is. a lot of times I check things on my phone which leaves out a lot. Hi Mike, this is a post where I pass on an award that I was nominated for receiving. I do not use my phone for blogging, but figure that many or most people do. i would need better eyesight ( hehe) to blog this way and a much better phone! I think more people will be interested in an award with no to-do list; it was the hours and hours it took to fulfill all the requirements that made me stop accepting and I know a few others who’ve said the same. You are singing to the choir. It does get real tedious, but I have yet to turn anyone down. I just adjust the requirements to my liking.